Address: Carreterra General S/N, Canillo, Andorra. 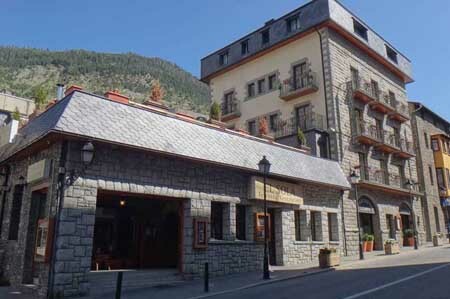 This family-run aparthotel is situated in Canillo, just 50 metres from the cable car to Grandvalira Ski Resort. Guests enjoy free access to the facilities at Palau de Gel, next to the aparthotel, that features an ice rink, swimming pool, tennis and squash courts, and a gym. Offering free WiFi, these comfortable, rustic apartments and studios feature a kitchenette with a microwave. The bathroom comes with hairdryer and toiletries. The El Solà restaurant serves homemade meals made with local products. There is a choice of a set menu or à la carte meals. The restaurant's sunny terrace offers views of the Canillo Valley. This is a place to discover a range of mountain leisure activities, from skiing to adventure sports such as climbing and abseiling. There is public parking nearby. Guests are required to show a photo identification and credit card upon check-in. Please note that all Special Requests are subject to availability and additional charges may apply. Please inform Aparthotel Llempó in advance of your expected arrival time. You can use the Special Requests box when booking, or contact the property directly with the contact details provided in your confirmation. Please note that the deposit must be paid in cash. American Express is not accepted as a method of payment.